Toilets are one of the biggest pain points of a dirty restroom. Dirty restrooms leave employees, customers, and visitors with a lasting negative impression. Stained toilets are quickly noticed and can harbor bacteria which produce those unpleasant odors. Thankfully, much of this restroom distress can be reduced through proper toilet cleaning procedures and the right tools. In most well-maintained public restrooms, toilets should be cleaned and disinfected daily. Keep a monitored maintenance log nearby as a reminder of when scheduled maintenance is completed. It is important to begin any cleaning procedure with the proper tools, commercial cleaning supplies, and personal protective equipment. The following provides a clear, step-by-step process to walk you through our recommended cleaning procedure. 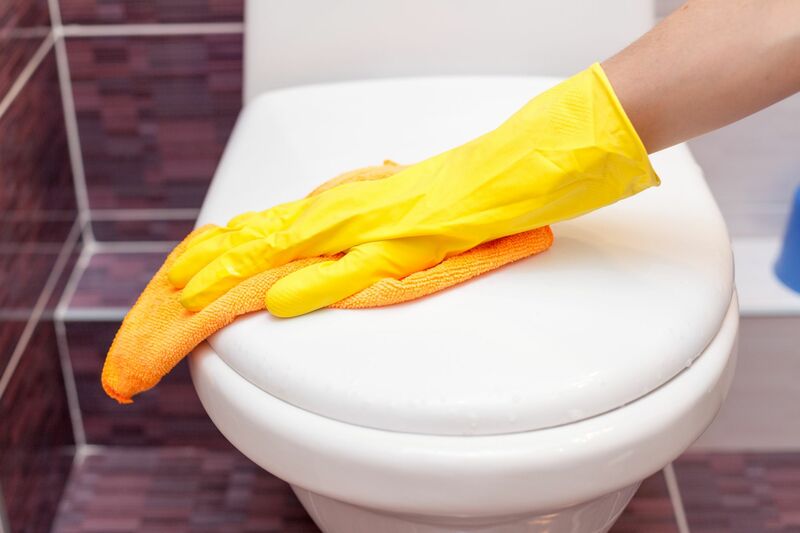 Remove all debris and loose soil from in and around the toilet. Give the toilet a flush to ensure it is clear and working properly. Tip: Always flush the toilet with the lid down (if there is one) to prevent splashes of toilet water or cleaner from leaving the toilet. Remove all visible stains with a multi-purpose cleaner or cleaner/disinfectant. Pretreat the toilet exterior, including the lid and seat, with disinfectant spray. Allow to stand for the recommended wet dwell time. Refer to the chemical manufacturer’s guidelines for the proper wet dwell time and dilution ratio for effective disinfection. Choose the best solution for your bowl. Identifying the type of stain may alleviate some frustration caused by persistent or amassed stains. Bowl cleaners are available in two variations: acid or non-acid. The choice is determined by how often the toilet is being cleaned. For everyday use, non-acid bowl cleaners are recommended. If you are dealing with stubborn mineral buildup, rust, or tarnish, acid bowl cleaners should be used. Due to the harsh nature of acidic cleaners, they should only be used when dealing with stubborn stains or during periodic deep cleans. Depending on the extent of the buildup on the bowl, the cleaner may need to dwell for an extended period of time. Step 4: Apply the Bowl Cleaner to Interior of the Bowl. Let Dwell. Scrub. Flush and use the bowl brush to force water over trap to remove excess water. Apply the chosen solution as close to the rim as possible. Let dwell. Starting under the rim, use your bowl brush to scrub inside the bowl. The rim is often forgotten and allows for the buildup of bacteria that can lead to that unpleasant odor in the restroom. Thoroughly scrub the interior of the bowl. Flush to rinse. Tip: Always clean from top to bottom and from dry to wet. Using a microfiber cloth or disposable paper towels remove the disinfectant from the toilet exterior. You should never use the bowl brush to wipe the handle, toilet seat, or other exterior parts of the toilet as this will lead to cross-contamination. We recommend the use of microfiber cloths because they scrub soils while reducing the spread of bacteria. Tip: If microfiber is used, choose a color to be used exclusively in the restroom and nowhere else throughout the facility to avoid potential cross-contamination. Disposable paper towels also work great to prevent the spread of bacteria. Remember to begin at the top of the toilet with the handle and work your way down to the bottom. Be sure that the high-touch point surfaces, the handle and toilet seat, are thoroughly disinfected. Daily maintenance can alleviate the buildup of hard water, mildew, and unsightly stains. Remember an important part of toilet bowl cleaning is disinfecting. Understanding the correct wet dwell time for the disinfecting product of choice will lead to less bacteria and nasty odors. Don’t let dirty toilets stain the appearance of your facility. 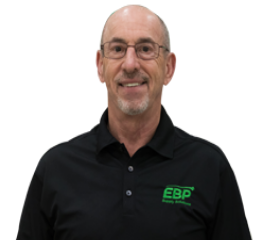 Glenn Rasin is the Chemical Specialist for EBP Supply Solutions and Lead Trainer for the EBP Training Academy, which offers CMI-certified training courses for supervisory and front-line cleaning professionals throughout the Northeast and Mid-Atlantic regions of the United States. He is an ISSA CMI-certified trainer, with over 35 years of experience in the janitorial and sanitation industry. 111 Melrich Rd., Suite A.